Spot Opportunities (Commercial Blog): Visit 6 Nashua Court, Middle River, our newest location! Visit 6 Nashua Court, Middle River, our newest location! This is it - the last month of our promotion. Hurry in! 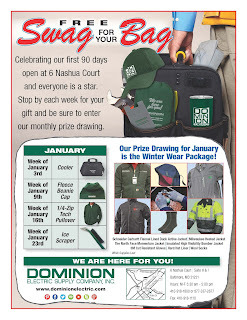 Our Prize Drawing for January is a Winter Wear Package! Baby it's cold outside! Includes 4 different use, style, and weight jackets, cut resistant gloves, hard hat liner and wool socks. Must be in-store to enter. And Get FREE Swag for your Bag!